Joe Preston, International President of Lions Clubs International, and Terry Mullin, CEO of ViridiSTOR LLC (left to right) at the United Nations. 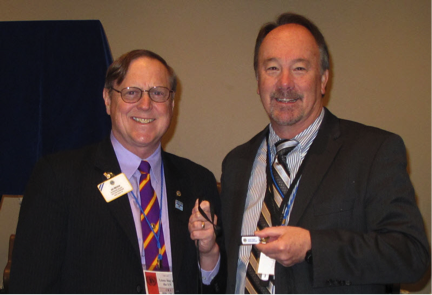 New York, NY – March 17, 2015 – ViridiSTOR LLC worked with Lions Clubs International (LCI) to deliver the Lions Day with the United Nations materials digitally on their Presenter USB. Held at the United Nations in NY, approximately 500 Lions representing the 1.36 million members from over 200 countries and geographic areas worldwide attended the day-long event in New York. “Building from the success of their International Convention in Toronto, which took some initial steps toward going paperless with our solution, the Lions are showing the world how sustainability can be achieved and make common sense,” stated Terry Mullin, CEO of ViridiSTOR. “And it was fitting that the theme of the United Nations is “Water for Life Voices” exhibition, highlighting the importance of fresh water to sustain life. By avoiding paper, tremendous amount of water avoid being polluted. Once again, the Lions demonstrated a sustainable event while making information of all types more valuable and available,” stated Mullin. The “Water for Life Voices” exhibition celebrates the conclusion of the UN-Water Decade for Action. It highlights the beneficiaries of water and sanitation projects and programs from around the world. As a part of the summit’s theme of Children in Need, Lions and U.N. leaders addressed issues affecting youth around the world, including drug prevention education, vision health and access to education in times of crisis. The event was an opportunity for Lions and the U.N. to discuss ways to positively impact some of the most vulnerable populations on the planet. And the access to clean drinking water is of key importance. 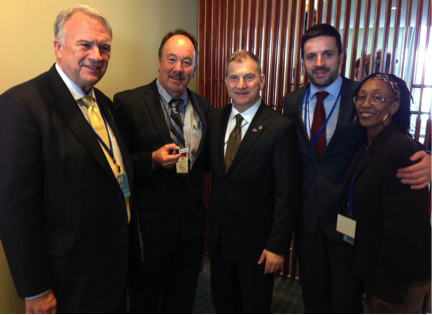 Lions at the U.N. summit were joined by more than 20 U.N. ambassadors. The assembly also discussed strategies for providing ongoing support of the U.N.’s Millennium Development Goals, which guide international efforts to meet the needs of the world’s poorest people. Al Brandel (PIP), Terry Mullin, Hon. Anthony W. Paradiso, Milos Stojanovic, and Charity Kagwi-Ndungu, presenters at the UN event (left to right). “All of the information from the sessions including 19 high-definition videos were delivered digitally on the Presenter USB,” Mullin said. “The organized content is on the USB so no Internet is required, making the Presenter USB indispensable as a reference and training tool and more. All of the ‘materials’ on the Presenter USB are digital including the International Peace Poster and Essay Winners submissions so users can search, sort, categorize, select favorites and share with their other members around the world” Mullin stated. “In working with LCI we are setting a new level of common sense sustainability,” stated Mullin. “With our ability to deliver information of all types digitally with no Internet required on Windows or Mac computers, the uses for our solution at all events is unlimited,” Mullin continued. “And considering the majority of convention attendees from over 30 countries travelled by air, the weight of paper is costly in baggage fees in addition to being inconvenient. By eliminating the need for paper at any event, our solution clearly demonstrates ‘common sense sustainability’ and provides unquestionable environmental savings by delivering information digitally,” added Mullin. Lions Clubs International is the largest service club organization in the world. Its 1.36 million members in more than 46,000 clubs are serving communities in more than 200 countries and geographical areas around the globe. Since 1917, Lions clubs have aided the blind and visually impaired, championed youth initiatives and strengthened local communities through hands-on service and humanitarian projects. For more information about Lions Clubs International, visit www.lionsclubs.org. Based in Tustin, CA, ViridiSTOR LLC was established with the goal of providing the world’s first environmentally and fiscally sound business solution for the information technology market. The Presenter USB and Green Box™ solution replaces paper-based materials at trade shows and conferences, greatly reducing the environmental impact of the event while increasing the usability of information for attendees. For additional information, please visit the company’s web site at www.viridistor.com.